Every year during Google I/O I feel more and more of an affinity for this company as they continually solve big issues and develop open technologies which, as a side effect, deliver time-saving, life-enriching features to its users. What most people don’t realise is the amount of effort (and money) they put into designing and giving away technologies to improve people's lives and further the technology era. Machine Learning is one such technology that Google started building years before when everyone else said it was impossible. And to this day, they have made public (given away) all the knowledge and built open source (that’s free for everyone to use and contribute) technology stacks and frameworks to power a better web. And as a consequence you and I get to use this technology in our everyday lives and businesses …. And for those who live much harder lives than the norm they are using that technology for the greater good. Now tell me that doesn’t bring a tear to your eye! Ok now down to business. From this mornings keynote presentation there was lots of fluffy duff but here’s the 3 things I found that will directly help your business over the coming months. OMG I didn’t see this coming but with Smart Replies so popular it’s a natural progression. For example, never type a long address again as Gmail will suggest/predict - based on the context of your email - what address you are typing in. It will auto suggest the name of the recipient to save you time. I can see this being a big winner just like the intuitive calendar/event features and smart replies! Google Photos is part of your G Suite core apps and has had smart, intelligent features for quite some time (see people search and Google Lens features) but there’s one other feature that can support your business operations. 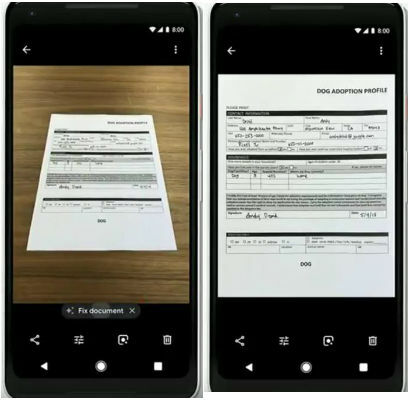 Take a photo of a document and Google Photos will suggest converting this to a PDF as a scanned image, clean it up and make it available as a document. No more fudging around for the scanning app, just click and shoot then convert later. Dumb name I know but hey, it’s a super cool feature. Now most people probably don’t use the Google Assistant yet let alone use it for business but this is going to change. We here at Shoosh Monkey are already building Google Assistant bots for businesses to do things like surface information from a voice search which is delivered from your company persona and with transactions now available we can use voice to order food, pay for a bill or subscribe to your services in a seamless conversation. The Duplex feature really solidifies the name “Assistant” as it can make a phone call and reserve a seat in a restaurant or book an appointment for you, it’s really amazing to see! Better Scheduling 3.7 is here!